This praise is especially high considering that, at the time, Florida engaged in a substantial amount of paving. Earlier in May 1916, the Times published an enthusiastic piece celebrating the state’s expenditures for road building. Readers were assured that Florida “is setting an example of the entire South. Indeed, it is setting a pace that it will be hard for any other State in the Union to more than match.”3 A large selection of the piece is scanned below. Fig. 1 Sarasota-Times, May 4, 1916. The vote of 1915 was eventually honored and Sarasota became a part of Florida’s boom of road building discussed above. On June 15, 1916, an article titled, “Sarasota-Venice Paved Roads Are Now An Assured Fact,” promised that “work shall be finished by the first May, 1917,” and that “it will only be a short time before workmen are swarming all over this city.”4 Bernard “Larry” Doyle is one of the men who came to help pave. Fig. 1. 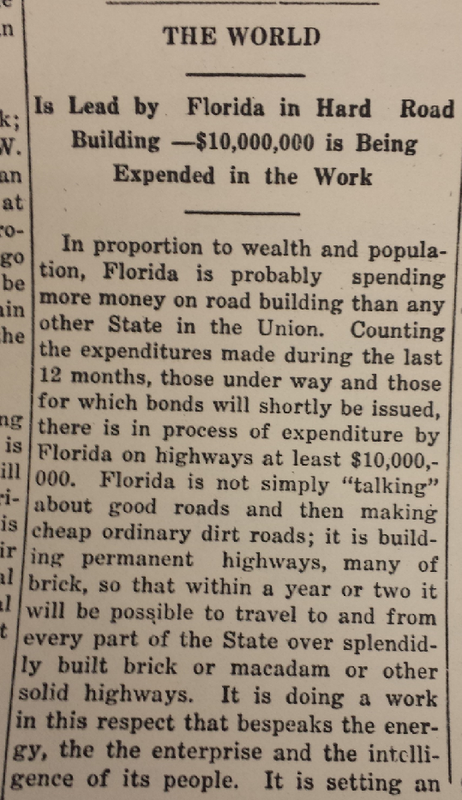 “The World Is Lead by Florida in Hard Road Building —$10,000,000 is Being Expended in the Work,” Sarasota-Times, May 4, 1916, courtesy of Sarasota County Historical Resources, Sarasota, Florida. “Good Road Bonds Sold,” Sarasota-Times, May 25, 1916. “The World Is Lead by Florida in Hard Road Building —$10,000,000 is Being Expended in the Work,” Sarasota-Times, May 4, 1916. “Sarasota-Venice Paved Roads Are Now An Assured Fact,” Sarasota-Times, June 15, 1916. “Secretary Of Agriculture W. A. McRae Sends Out The Following Article On The Roads Of Florida,” Sarasota-Times, January 25, 1917. “Ahead Of Other Southern Towns,” Sarasota-Times, May 2, 1918.